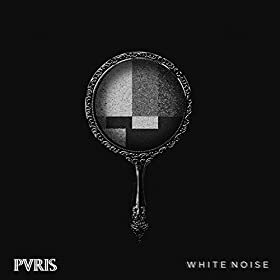 PVRIS will undoubtedly get comparisons to Paramore, as it seems most female fronted bands do, and while one can draw a few similarities in sound from a handful of songs, the band is en route to creating an identity and sound all their own. The album opens with “Smoke,” a drum heavy tune with a driving groove that is a good first glimpse at what the band is shooting for with their sound. Following is the trio’s first single “St. Patrick,” the obvious choice for single given that it is rock enough to make it edgy and catchy enough to find itself on the radio. However, the first true glimpse of the power that singer Lyndsey Gunnulfsen has comes in the form of standout track “Fire.” The mid-album treat opens with a subtle bass beat thumping over Gunnulfsen’s voice before throwing the rest of the band in. It’s a driving song that leaves the rest of the album in its dust. Another great track-- a strong contender for favorite-- comes in the form of ending track “Let Them In.” Another strong number, it highlights the fact that Gunnulfsen’s voice shines brightest when it’s boiling over, a growling midpoint between pretty and screaming. It perfectly embodies the anger that comes from a betrayal, and it will most likely become a fan favorite live. Unfortunately, amongst the highs of PVRIS’ debut album, there are also a few lows. “Holy” sounds very much like an Echosmith track, and it does nothing to showcase the group’s talent. “Eyelids” is another track that is easily forgotten and the only saving grace of the more poppy “Ghosts” is the gritty high note that is hit at the end. All in all, PVRIS is certainly on the right track with what they’ve created as a debut release. There are certainly shining moments when it’s obvious exactly where we can expect the Massachusetts natives to be in a couple of years, they just aren’t fully there yet. We can’t wait to hear them when they do though. White Noise is out November 4th.